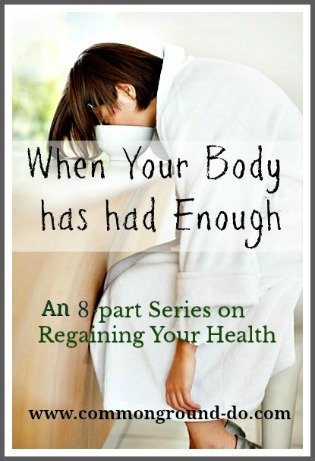 Does that title sound like I've lost my marbles? Like a crazy cat lady that spends all her time bird watching with her felines? Hope you all are having a great Labor Day Weekend. We stuck close to home except for a fun trip on Saturday to a new winery in the area. I'll show you a few pics and share a link with you soon. They also have a sheep farm, so that was the real draw for me. We've had a heat wave this last week, and it's supposed to break in the next few days. We had such a wonderful taste of cooler weather earlier. Hopefully, that will bring us back to the 70's. gosh, I'm more than ready. I've been slowly working on bringing in Fall, and I just had to have a few birdies perching here and there. I'm like the birds, I love Fall and get a new perspective once the temps lower and the leaves start changing. They've been foraging for seeds in my tired container plants. The dried marigold seeds seem to be a winner. I have stacks of prints downstairs that I'm trying to sort through. I'm sort of a hoarder collector of small prints and now at this house, I have way too many of them. But I do love to rotate things seasonally, so I found this vintage bird needlepoint and used it on the Entry console. Some velvet pumpkins and vintage brown wicker baskets just big enough for a perch. 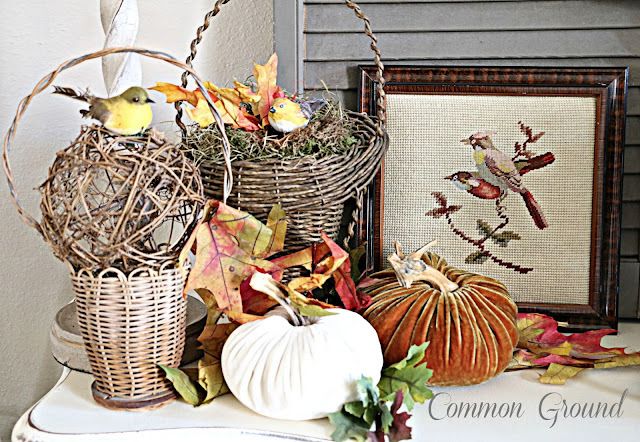 When I put together this vignette, I still had my English Cottage with Sunflowers print here, but decided the needlepoint needed to be here with the birds. 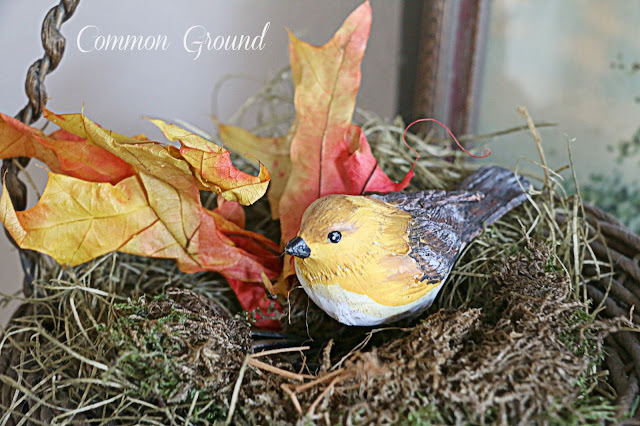 My older daughter found this 3 dimensional bird plate quite awhile back for me, and the colors were perfect to mix here on an end table for Autumn. ...right next to one of my wonderful hand-made pumpkins from Becky at Timewashed. 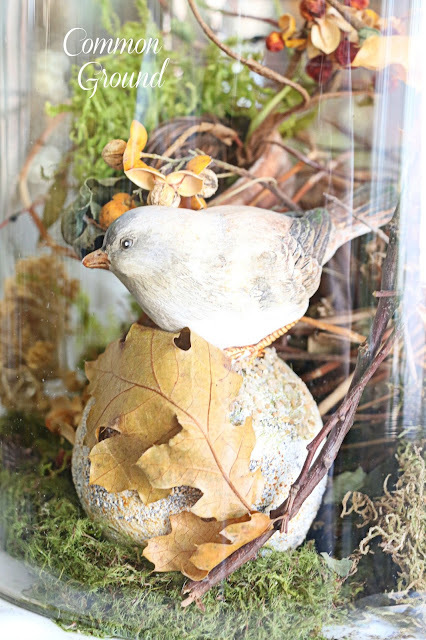 If you missed my First Glimpse of Fall with a Nature Themed Cloche he's here on the Dining Room Buffet right now. We have some projects to get to outside, but it's too hot. They'll have to wait till it cools down a bit. 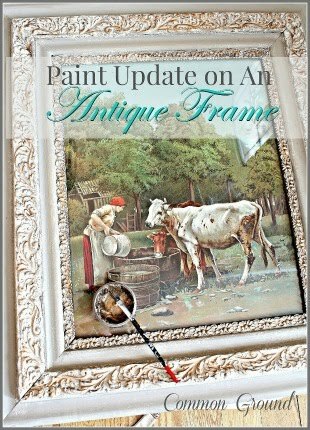 You are really great at creating vignettes Debra. I love that 3d plate! 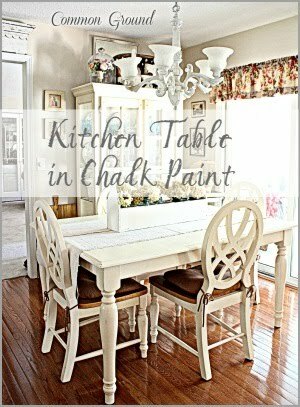 Your vignettes are very pretty and the Fall look is great. I am so tired of HOT weather and I want it to be Fall. Last week we had a little tease with cooler temps, but, today is was blasting again. Looks like we will have this hot weather for another 1=1/2 weeks. Ugh. I am almost finished decorating for Fall, but nothing outside yet - to hot to work out there unless I go out there with a flashlight. Your birdies are so cute - enjoy Labor Day. You always do fall so well and inspire me to start making changes here and there...and I love the birdies. We are in a heat wave just north of you and great...we have a respite coming this week. I'm so grateful we have had a relatively good summer! Just love seeing your vignettes, Debra. 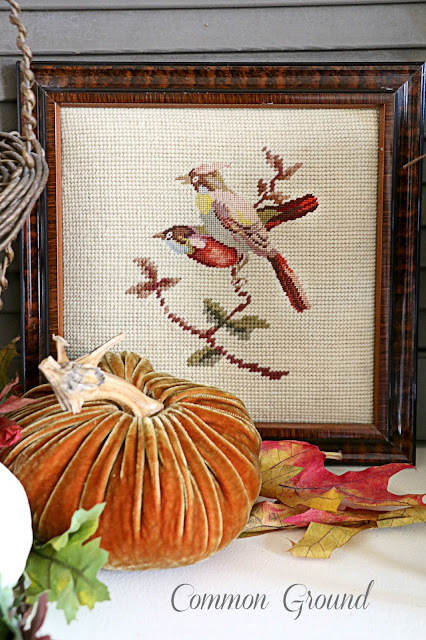 The birds are all adorable…especially the needlepoint in the frame. Debra, your fall vignette is perfect for welcoming the season. I put out a few velvet pumpkins this weekend and am starting to add other touches here and there. Seeing your birds reminds me that I bought some paper mache birds on sale after Christmas. They might work for a fall vignette. Thanks for the inspiration! 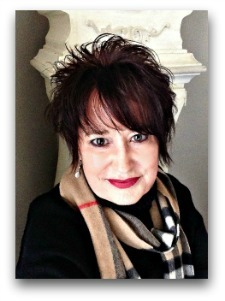 I love your fall vignettes, Debra. 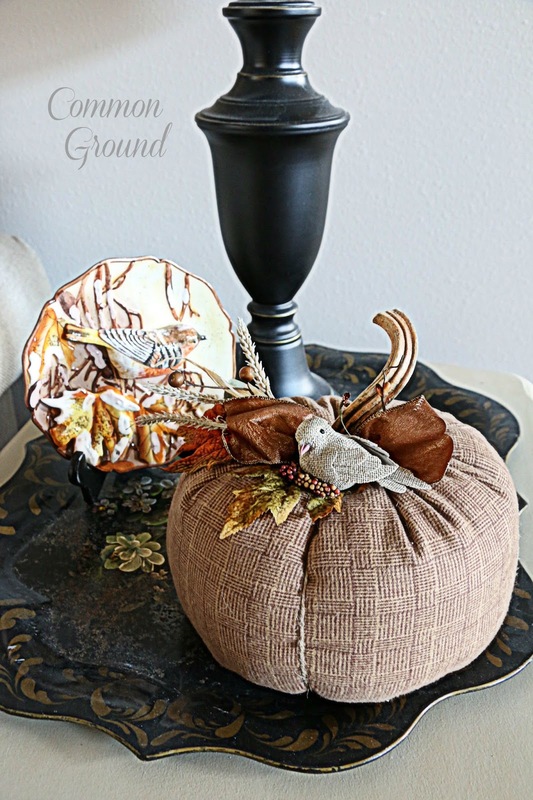 Those cloth pumpkins are so nice and easy to store, and I love Becky's work too. It's hot here too. Early morning walks and quick watering of containers are about all the outside activity I've been doing lately. We haven't had rain in almost a month, and the landscape mulch beds look like desert dirt with cracks all through them. Enjoy your day. Your fall vignettes are just gorgeous, Debra!! I love all the natural elements you incorporate with the adorable birds. Your vignettes are so adorable! I love the bird needlepoint. Your bird themed tabletop is so sweet! You actually use your vintage goodies for your displays, so I don't think you can truly be categorized as a hoarder, Debra. I love the vintage needlepoint and your cute little birdies, too! I had my garage sale on Saturday, the hottest and most humid day of the year. ugh Today it's blue skies and cool temps. Heaven! Enjoy the beautiful fall weather! Happy Labor Day, dear friend!!! Gorgeous Autumnal Decor in yur Entry Hall!!! I adore the birds with all the warm hues sprinkled lightly about your vignette!!! 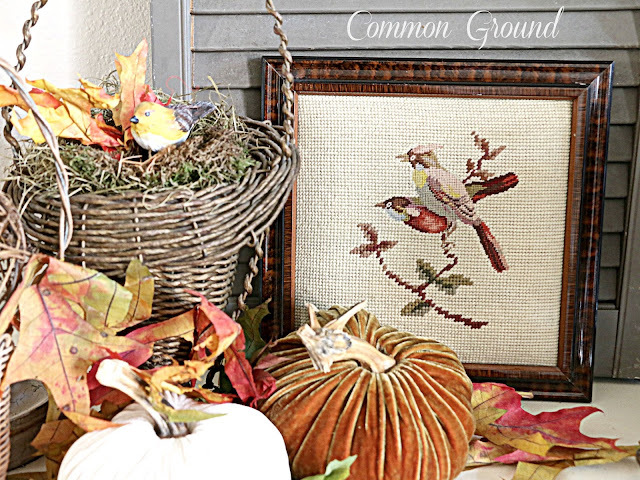 Thneedlepoint bird print is a "perfect" choice!!! 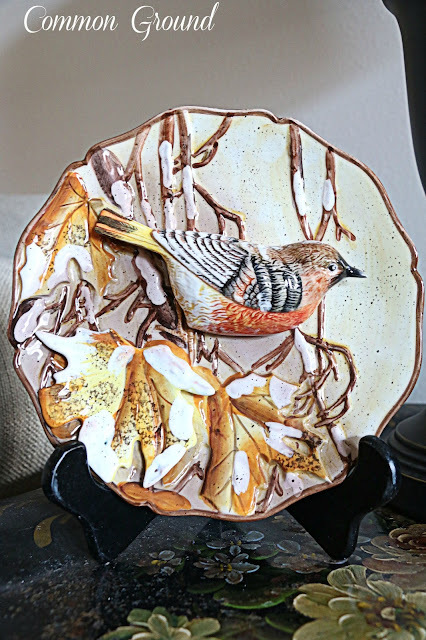 I'm swooning over your three dimensional bird plate!!! Stay cool and hopefully we'll both be enjoying "cooler" Autumnal temperatures, soon!!! So much beautiful inspiration for fall. Your decor is so pretty Debra. Love all your sweet birds in the vignettes. Have a great new week. Pretty, pretty, pretty! 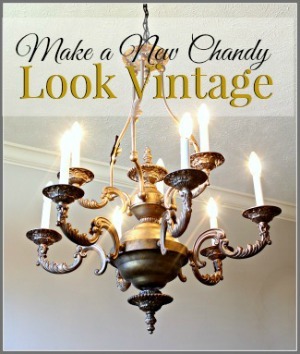 Love your displays with old, new, and meaningful. And yes, it's TOO HOT! 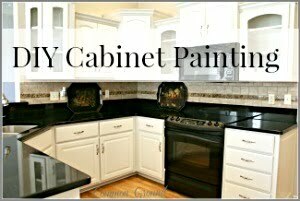 Love your vignettes, Debra! I love the cross stitch birds, the 3d bird plate and your little birds under the cloche. 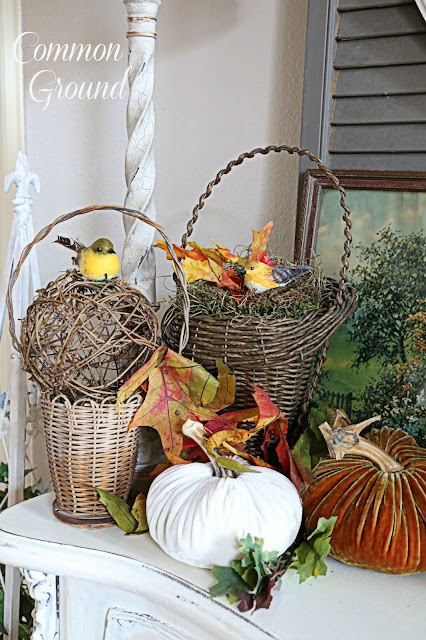 Your Fall vignette looks so pretty! i like how you mixed birds with the Fall foliage. It's finally feeling a bit cooler around here to make me think about decorating for Fall. Lovely vignettes - I am quite attracted to your birds. 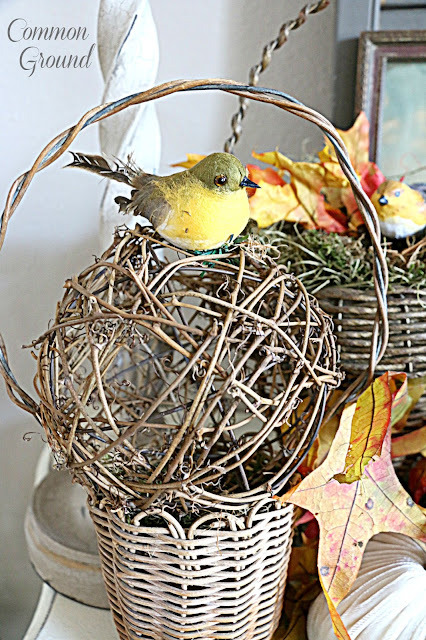 I love your birdies for your autumn decor! Everything is very inspiring, Debra! 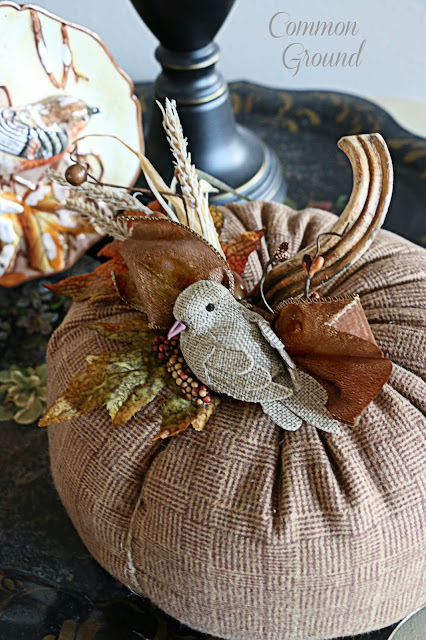 Debra, love all your fall things-- especially all the birds, and especially the brown tweedy hand-made pumpkin. 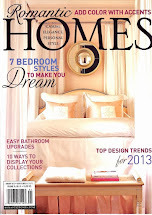 Love love love cloches and yours are absolutely beautiful!!! Debra, I am a bird lover and I really like them tucked in your fall vignette. 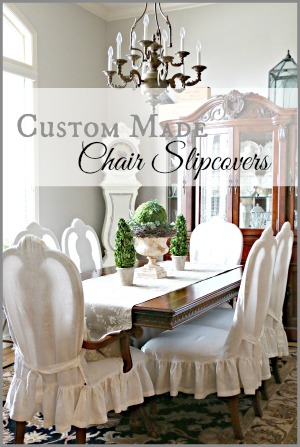 I love the needlepoint and the dimensional plate is perfect! 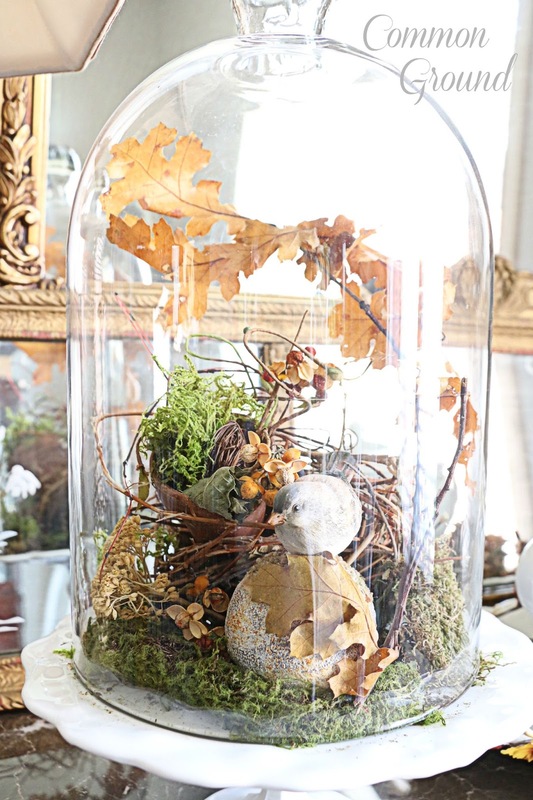 Your fall cloche is fabulous! Thanks for sharing with SYC. Oh! The bell jar arrangement makes me regret getting rid of my biggest jar. 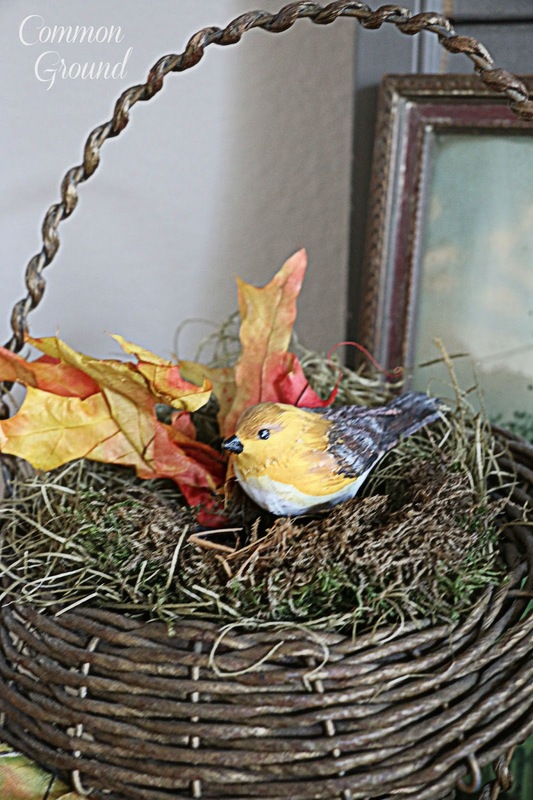 Especially since I just picked up a robin's nest that would do nicely with a few other fall-ish things. I enjoyed my visit.